In the third decade of the third century CE, climate issues, civil war, economic depression and plague combined to seriously destabilize the Roman Empire. Beginning a fifty-year period where leadership of the empire passed between at least 26 men was the short reign of perhaps the largest emperor of Rome, Maximinus Thrax. Born Gaius Julius Verus in about 173 CE in Thrace (the area between the Aegean Sea and Black Sea that includes portions of Bulgaria, Turkey and Greece today), young Maximinus entered the Roman military in 190 CE, and due to his enormous size and great strength, he quickly rose through the ranks. 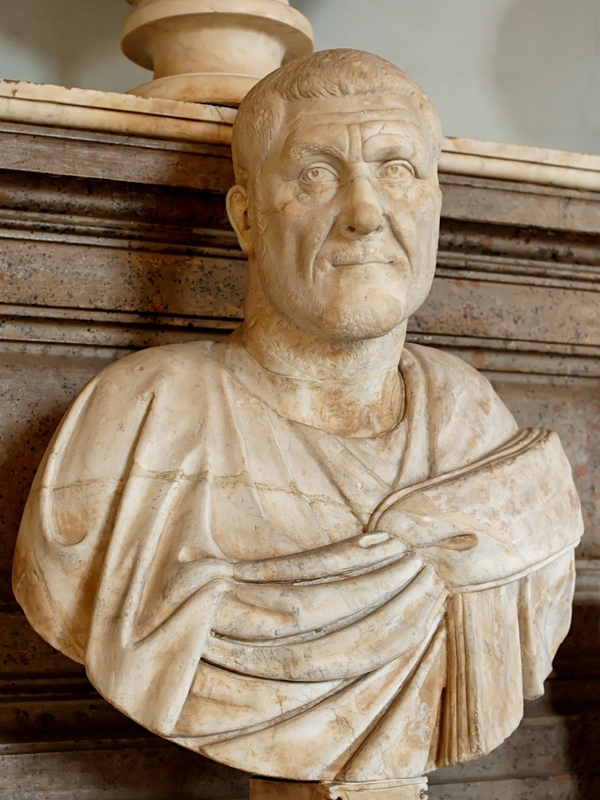 While it’s not clear precisely how large Maximinus was (some historic sources claim a likely well exaggerated equivalent of eight and a half feet tall), Maximinus was widely reported as towering over his contemporaries both in height and muscular girth. Often depicted with an extraordinary large brow, nose and jaw, and with most reports agreeing that he was “of… frightening appearance and colossal size,” many theorize he may have suffered from acromegaly or gigantism. Adopting the name Thrax to denote his origins, Maximinus held posts as a legion commander in Egypt (around 232 CE), became governor of Mesopotamia, and was leading recruits of the Legio IV Italica in Germany by 234 CE, after being promoted to the position by the emperor, Alexander Severus (208 – 235 CE). Severus’ reign was marked by a variety of problems including, notably, a large influx of tribesmen from the northwest who had been forced south in search of suitable farmland when climate change and sea rise ruined agriculture in what is today the Low Countries. However, Severus was focused on a simultaneous threat from the Sassanid Persians crowding in the from the east; as a result, he neglected the West, which led to a number of Roman legions suffering inglorious defeat at the hands of the Germanic tribesmen. When Severus finally turned his attention to the west, however, rather than wage war against the Germanic chiefs, as the legionnaires wanted him to, he tried to pacify them with payments and diplomacy. Disgusted, the troops killed Severus and his mother in 235 CE at Moguntiacum, and then elected Maximinus to be their leader. He was proclaimed emperor by the army on March 20, 235 CE. Although the Senate on the whole despised Maximinus, considering him a peasant and barbarian, they ultimately approved his position- it helps to have the army at your back. Suspicious of the nobility, Maximinus had many of Alexander Severus’ close advisors killed, fearing they were plotting his demise (at least two conspiracies were uncovered). The first conspiracy involved stranding Maximinus on the other side of the Rhine in hostile territory (during a campaign there) by destroying a bridge behind him; this was discovered, and the disloyal conspirators were killed. The second attempt was foiled when the leader of the plot switched sides, although he was eventually put to death as well. Keen to put an end to the incursion of the Germanic tribes, Maximinus crossed the Rhine and raided their villages. After a fierce battle with heavy losses near Baden and Wurttemberg, Maximinus prevailed, and established a short-lived peace in the region. As a result, he was proclaimed Germanicus Maximus. It should come as no surprise that Maximinus spent heavily on campaigns, conducting near constant warfare and doubling soldier pay. As a result, the already overtaxed populace was forced to pay even higher taxes, which further alienated them from the ruling class – hurting Maximinus’ popularity. So, when the province of Africa revolted in 238 CE and the landowners named their own governor and his son (Gordian I and II, respectively) co-emperors, the Senate seized the opportunity and threw their support behind them, granting the Gordian’s the title of Augustus. Accordingly, the previous emperor marched on Rome; but long before he got there, the governor of Africa’s neighboring province of Numidia, Capelianus, who hated the Gordian’s, raided Carthage and killed the son; elder Gordian killed himself. Maximinus’ troubles continued, however. The Senate, realizing that their vocal support of the Gordian’s put them on the outs with the emperor, after a fair bit of infighting eventually declared Gordian I’s grandson, Gordian III, Caesar. Learning of this, Maximinus continued his march to Rome, but by this time, even his own troops had grown weary of him, particularly after a long, unexpected siege of Aquileia that saw famine and disease spread throughout their ranks. As a result, in May of 238, they cut off the heads of Maximinus, his son, and his chief ministers. They then put the heads on poles and carried them to Rome. Easy come, easy go. The word “giant” ultimately derives from the name of a Greek mythological race of giants defeated by the gods, with the help of Heracles, when the giants tried to free the Titans. This race were called “gigas” and were the children of Gaia and Uranus. They were produced when Kronus castrated Uranus, with Uranus’ blood fertilizing Gaia. Once the giants were defeated, they were buried deep underground to imprison them. According to Greek mythology, earthquakes and volcanic eruptions are caused by the race of giants struggling to free themselves from the depths of the Earth. The Greek word “gigas” evolved into the English word “giant” via Latin and then the Old French “geant”, which by 1350 had been adopted into English as “giant”. It was first used to describe a person who is exceptionally tall in 1559 and before that simply as an adjective to describe some attribute that a person had that was exceptional. A disorder of the pituitary gland often caused by a benign tumor, acromegaly and gigantism occur when the gland makes too much growth hormone (the former when it happens during adulthood, and the latter when it happens during childhood). 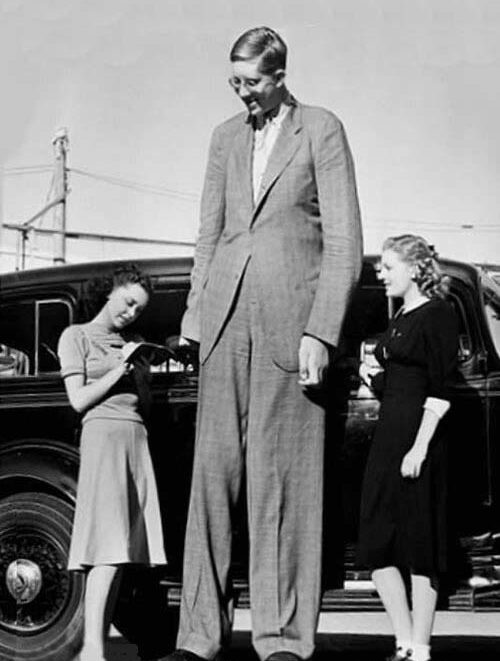 About 3 people out of every million develop acromegaly. Common symptoms of acromegaly include abnormal growth in the hands and feet, and continued growth in the face, where the brow and nasal bone are enlarged, the jaw protrudes and spaces develop between the teeth. Since bone and cartilage continue to grow, arthritis is common. Other symptoms include headaches, joint aches and vision problems, and if left untreated, high blood pressure and type 2 diabetes.